Update: CRM Magazine has more about the five eras, focus in on the graphic. It’s important to note that these eras aren’t sequential, but instead are overlapping. We’ve already entered and have seen maturity for the era of social relationships, have entered social functionality but haven’t seen true utility, and are starting to see threads of social colonization with early technologies like Facebook connect. Soon these federated identities will empower people to enter the era of social context with personalized and social content. The following diagram demonstrates how we should expect to see the eras play out in the future –with social commerce the furthest out. Research isn’t done in a vacuum, that’s why we conducted qualitative research to find out what we should come to expect. We came to these conclusions based on interviews with executives, product managers, and strategists at the following 24 companies: Appirio, Cisco Eos, Dell, Facebook, Federated Media Publishing, Flock, Gigya, Google (Open Social/stack team), Graphing Social Patterns (Dave McClure), IBM (SOA Team), Intel (social media marketing team), KickApps, LinkedIn, Meebo, Microsoft (Live team), MySpace, OpenID Foundation (Chris Messina), Plaxo, Pluck, Razorfish, ReadWriteWeb, salesforce.com, Six Apart, and Twitter. Don’t Hesitate: These changes are coming at a rapid pace, and we’re in three of these eras by end of year. 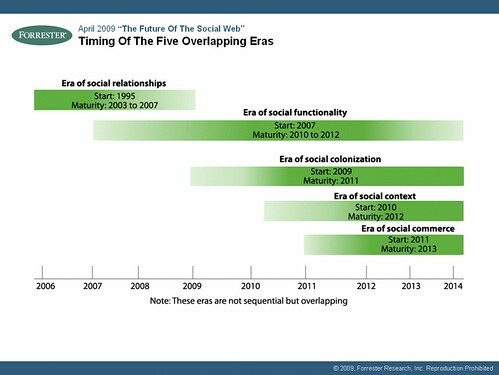 Brands should prepare by factoring in these eras into their near term plans. Don’t be left behind and let competitors connect with your community before you do. Prepare For Transparency: People will be able to surf the web with their friends, as a result you must have a plan. Prepare for every webpage and product to be reviewed by your customers and seen by prospects –even if you choose not to participate. Connect with Advocates: Focus on customer advocates, they will sway over prospects, and could defend against detractors. Their opinion is trusted more than yours, and when the power shifts to community, and they start to define what products should be, they become more important than ever. 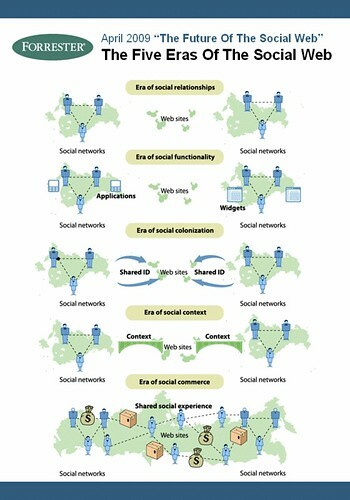 Evolve your Enterprise Systems: Your enterprise systems will need to connect to the social web. Social networks and their partners are quickly becoming a source of customer information and lead generation beyond your CRM system. CMS systems will need to inherit social features –pressure your vendors to offer this, or find a community platform. If you translate this blog post, I’ll add your link here and credit you. Want to translate it into your language? I’ll be happy to add you, read these suggestions. This project took a team effort, and I’d like to thank Josh Bernoff a guiding force in my career, Emily Bowen who kept the project going, Cynthia Pflaum for the quantitative data, Megan Chromik in our editing team for the polish, and Jon Symons in our PR team for the media outreach. This is also cross posted on the Forrester blog for Interactive Marketing Professionals. Thanks to Matt Savarino for catching a small typo.